If you, your family, and your friends love Italian food as much as everyone in our family does, then you probably enjoy cooking with anything infused with fresh herbs, like Italian herb vinegar. Oils and vinegars keep those yummy Italian herbs nice and fresh, while still imparting plenty of flavors to every Italian or Mediterranean dish that you chose to make with them. And, if your family and friends are like my family members, you will end up cooking lots of Italian dishes for them. From salads to main dishes, you’ll love cooking as much as we do with homemade Italian herb vinegar. 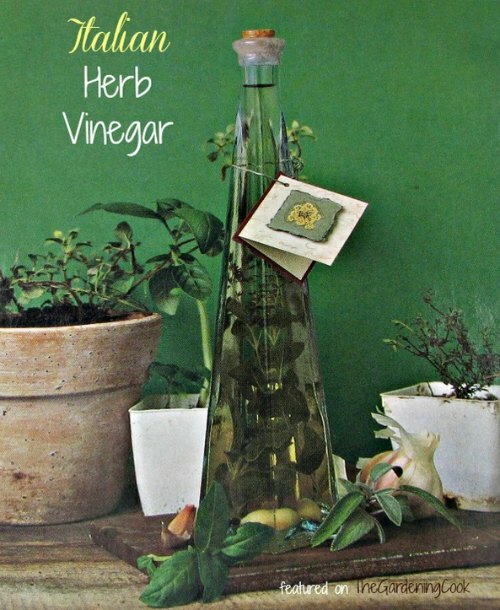 So, you’ll probably want to try the delicious Italian herb vinegar recipe that we found. It makes the perfect Italian herb vinegar for all of your Italian recipes and also makes an excellent gift for any occasion as well. Whether you need a nice culinary gift for a housewarming or for the holidays, you can put this Italian herb vinegar in a pretty decorative bottle, dress it up a little and you’ll wow anyone that you choose as a gift recipient for this homemade delight. What we really loved about the Italian herb vinegar recipe was that it only required seven ingredients and most of them we already had in our kitchen. And, we only needed six items for the necessary supplies, too. The main ingredient is, of course, good quality vinegar. Although there are many types of vinegars, the most effective flavors for an Italian herb vinegar is apple cider vinegar, rice wine vinegar, or red or white wine vinegar. There are also several tips in this helpful guide that will provide you important information. For example, it offers several recommendations for storing your completed vinegar and helpful hints for keeping it fresh and clear (we didn’t realize that storing it in sunlight could cause cloudiness, but now we do).